Posted on July 1, 2016 at 1:50 am. 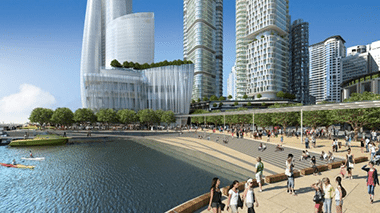 CONTROVERSIAL casino-hotel resort Barangaroo has been granted approval from the NSW Planning Assessment Commission (PAC) to begin construction as the city’s second casino after The Star. James Packer‘s hotel and casino project has weathered several changes and delays following a commission hearing concerns from a three-panel group comprised of the local council, community and design professionals. Their proposed changes along with assessment from the PAC resulted in a final development plan including more public green space at Hickson Park, a public viewing tower at the top of the Barangaroo hotel’s tower and the western foreshore widened 30 metres from harbour’s edge for better pedestrian access. The “proposed scale and form of Crown Sydney will be a sculptural and elegant signature building on the foreshore”, the panel concluded. “These changes combine to provide for a significant increase in the area of public domain – of some 4500 square metres compared to the original proposals,” the PAC’s determination statement said. Last week Crown announced its demerger of investments in joint-venture casinos in Macau to separate its Australian and international interests. “Crown will assess its capacity to make a distribution to shareholders, and at the same time maintain a strong balance sheet and credit profile to fund existing Australian development projects,” a statement from Crown said. The Crown Resorts complex will cost $2 billion, with 53 per cent of the project owned by James Packer. The resort will host a six-star hotel with over 300 rooms, world-class dining and a conference centre. Meanwhile, a VIP casino is still part of the new development plans. Crown Sydney is scheduled to open for business in 2021. In the mean time, if you are from United States and looking to have a cheeky punt online today, we recommend you take a look at Bovada Casino and take advantage of the specials.